A stone bench top is very durable and hard-wearing, which makes it a great choice for high use areas. 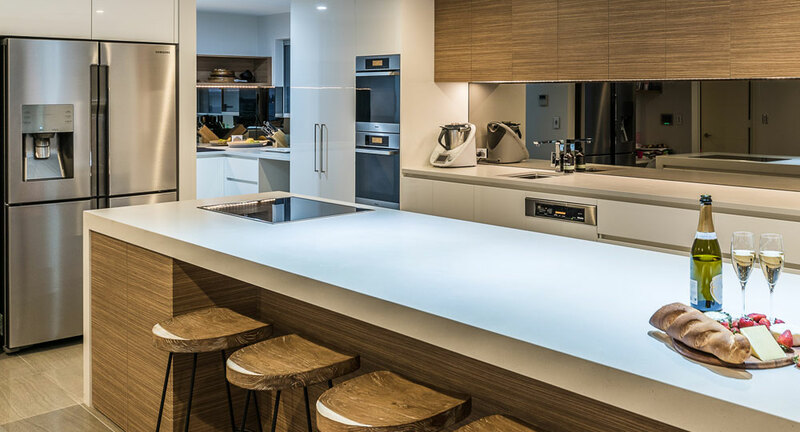 Here are a few commonly asked questions and some suggestions on how to care for your stone bench tops to leave them looking just as good as the day you got them. Is it ok to put hot pots directly onto your stone bench top? No, especially not straight from the stove. Putting a concentrated heat source on once section of the bench causes uneven heating, which runs the risk of cracks occurring as the stone expands. It’s always best to use a heat pad or wood chopping board instead, as replacing a cracked bench top can be very costly! Is it ok to use a scourer or Jiff to remove a stubborn stain? The surface of stone is highly polished, so abrasive cleaning products can cause patches of your bench top appear dull and lose their shine. Unfortunately, this cannot be ‘buffed’ out or the bench top surface re-polished. The best thing to do is to wipe clean your bench tops regularly, especially after cooking or making a cup of tea or coffee. A microfibre cloth works brilliantly to keep the surface clean and streak free. There are also specialised cleaning products available from stone suppliers or look for a ‘stone safe’ product at your local supermarket. Can I stand on my bench top to change the light globe? Although stone tops are strong, they are not that strong! Due to the nature of the material, excessive weight in a concentrated area can cause your bench tops to crack. It is best to always use a ladder – and it’s much safer too! And finally, take care when placing items on your bench tops. Fixing scratches and chips can become a costly exercise and will never look as good as the original bench top.